A top notch home inspector uses the latest technologies to detect hidden defects such as moisture and mold problems. 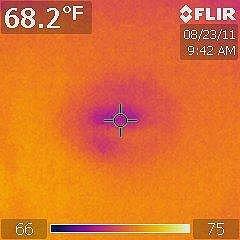 A small percentage of home inspectors are able to do this through the use of a thermal imaging camera. The pictures below provide good examples of how thermal imaging works. This first image shows a first floor ceiling under a leaking shower on the second floor. This issue is difficult to detect with the naked eye, but easy to see with a thermal imaging camera. The darker colors are the wet areas of the drywall. When the drywall is wet, it shows areas with elevated moisture as being colder than the surrounding material. The source of a leak can often be pinpointed by the coldest temperatures on the image. This picture shows a garage ceiling under a leaking roof. And this image shows wet drywall as the result of ice damming. In addition to detecting moisture issues, thermal imaging has other advantages. It can be used to show areas of insufficient insulation in a home. Electrical wiring and electrical panels can also be scanned to check for overheating in wiring or a possible circuit breaker failure. 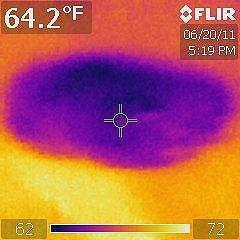 Thermal imaging can even be used to find hot spots in knob and tube wiring that is buried in insulation and overheating, a problem that can be found in some older homes. 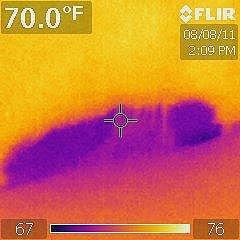 Over the years, home inspector Brian Paull has uncovered many moisture issues for our buyer clients through the use of his thermal imaging camera. In one case, Brian found a small leak in the foundation of a finished basement. That small leak led to elevated moisture levels in the carpet padding and the underside of the drywall lining the basement. The elevated moisture levels caused a large mold problem in the basement, none of which could be seen through the naked eye. Fortunately for our clients, they hired the right home inspector. And we used the results of the inspection to successfully negotiate the desired outcome for our buyers. A special thanks to Brian Paull from Premier Inspection and Consulting for his contributions to this article. Our team and our clients truly appreciate all of his fine work.